A choker is a tight-fitting necklace worn high on the neck. Popular during the 18th century, they were typically of an openwork gem-set band design. They were fitted to the neck by means of a ribbon either woven through the piece or threaded through loops at the back designed for this purpose. In the latter part of the 19th century and early years of the 20th, the choker evolved into the dog collar or collier de chien. This style was wider and generally featured a plaque at the center (plaque de cou) and finished by a ribbon or multiple strands of small pearls. Dog collars were often accompanied by a variety of other necklaces varying in length for a magnificently jeweled look. One other notable choker style made an appearance in the 1980s as a metal collar-like band set with gemstones reminiscent of the Celtic torcs. A classic strand of pearls worn close around the neck (15 inches in length) has also been a favorite choker style for most of the 20th and 21st centuries. 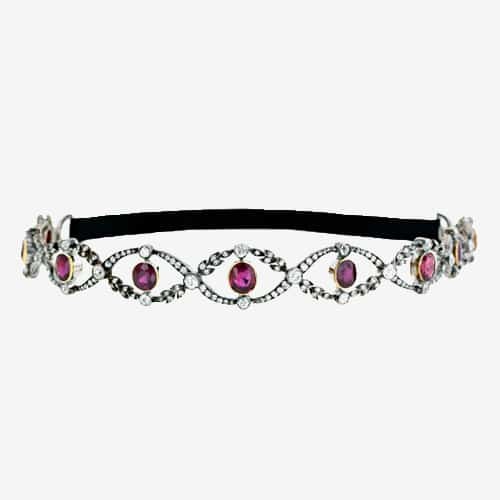 Edwardian Garland Style Ruby and Diamond Bracelet-Choker.